All HSM Professional shredders feature hardened solid steel cutting rollers, which are unaffected by stables and paper clips, a powerful drive for high performance even when being used for long periods of time. These machines are quiet and are great for high volume use in a large office or centralized area with a stand-by operation with LED screen and cutting rollers with patented HSM V groove. The HSM shredders stop automatically when the waste container is filled and a removable, reusable waste bag is included with all machines. The HSM 390.3 and HSM 411.2 also feature a convenient automatic reverse feature in the event of a paper jam. The HSM 412.2 and HSM 450.2 also feature a keypad control for constant operation and reverse, and with a large filling hopper and integrated, rotating loading aid, it can destroy entire computer listings and shred floppy disks, CD’s, credit cards, and store cards. If you have any questions or are interested in purchasing the HSM Heavy Duty Centralized Shredders, visit us at SpiralBinding.com. 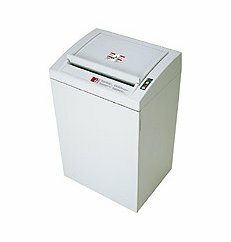 We have great pricing on a full line of Centralized Office Shredders. Call us at 1-800-631-3572 for more information!